Cassie Bustamante and Theresa Carver now owners of Primitive and Proper, a successful restoration business,met by chance through a Craigslist transaction a number of years ago and wouldn't consider anything else they would rather do than paint furniture. One email lead to the next and the two were exchanging ideas and eventually teamed up together refinishing wood furniture, that had once seen better days. Located in Virginia where antiques surface often, Theresa brings a unique edge growing up in North Yorkshire, England which is known for their antique gems and painted furniture. Both are busy mothers find time to paint after their children go to bed, get their inspiration from their children's playfulness, and hope to pass on their treasures to moms looking for a creative piece for their growing children's rooms. Their selection of painted furniture range from cottage styles, to old world black polished pieces, to French painted furniture. Primitive and Proper search all over Virginia, DC, and Maryland for their unique furniture finds, but they also work on commission if you want a custom painted piece of furniture. Having a large gallery of pictures, a person can certainly get ideas from their wide selection of sold pieces. 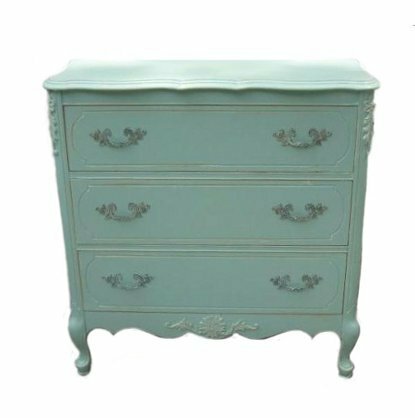 This gorgeous curvy French Provincial dresser was painted by Primitive and Proper. The beautiful blue and distressing really gives an attractive look to this mid size french chest. Q: How can amateur painters accomplish this beautiful professional finish you achieved with these two nightstands? 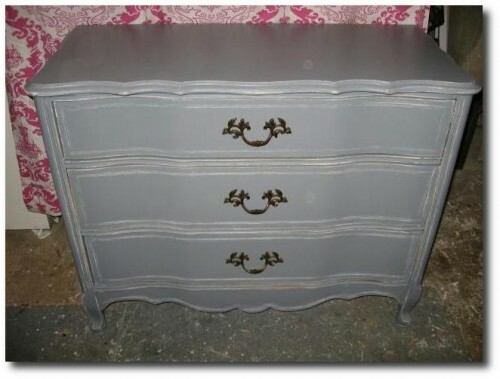 Do you have any tips for first time painters wanting a unique look for their furniture using paint? Cassie- "I would not consider myself a professional painter as in some sense I use the good ol' fashioned method. I do not have a sprayer, as many furniture painters do, and do everything by hand. With that being said, it is very important to invest in good quality brushes for a smooth look as well as good primer. I use zinnser, which smells awful, but works beautifully. I have found with zinnser I only need to lightly sand the piece to be painted. Once it has been sanded, the primer is brushed on by hand and it is very important to follow the direction of the wood and go in nice straight lines. You can "feather" as you brush on so that you won't see where you lifted the brush off of the piece. Once the primer has dried, you can use another coat of primer, which I do in the case of white pieces. After the second coat of primer, I begin painting and use just latex paint. I prefer to use Sherwin and Williams harmony paint which is low voc, cost efficient, and good quality. I personally prefer the eggshell finish, which was used on these tables. Again, follow the same brush strokes as your primer for a smooth and even look. After the piece has been painted with 2-4 coats of paint, the edges are distressed by hand with 80-120 grit sandpaper. Some sites will recommend higher grit, but i prefer the lower grit and just move my hands very rapidly as I distress to avoid getting scratchy marks (if you do get these marks, you can touch them up). Once it has been distressed and wiped clean with a damp paper towel, I sometimes choose to antique it, as was the case with these nightstands, to give it a more old world look. There are specialty glazes you can purchase, but I use my trusty minwax stain and brush it on, and then wipe off with a rag, again following the lines of the paint. You can use as many coats of stain as you need to achieve the desired look." Previous articleWorking For Yourself, You Can Do It Too. I know! The sage green vanity is my favorite as well. All that furniture is from Cassie’s furniture collection under Primitive and Proper. SHe is an expert painter, and has painted hundreds of pieces~ She is a good friend of mine. Her color choices are always bang on! French furniture comprises both the most sophisticated furniture made in for king and court aristocrats and rich upper bourgeoisie on the one hand and made in the provincial cities and towns many of which like and retained cultural identities distinct from the metropolis. There was also a conservative artisanal rural tradition of French country furniture which remained unbroken until the advent of the railroads in the mid-nineteenth century.